King Solomon was the richest king who ever lived (1 Kings 3:10-13; 2 Chr. 1:11-12). He was beloved of God (2 Sam. 7:13-15). The name Solomon means peaceful, and he was the builder of the Holy Temple in Jerusalem. He also was the first king of Israel to trade commercial goods profitably with other nations, and was the author of Proverbs, Ecclesiastes and the Song of Solomon. According to the chronology in 1 Kings 11:42, Solomon was about 20 years old when he was crowned King over Israel. He assumed leadership of Israel from his father King David at a time of great material and spiritual prosperity. During his 40-year reign (970 B.C.—930 B.C. ), he expanded his kingdom until it covered about 50,000 square miles-from Egypt in the south to Syria in the north to the borders of Mesopotamia in the east. Among the first acts of King Solomon was offering sacrifice at Gibbeon. God appeared to the new king at night and asked him, “What shall I give thee?” Solomon asked for an understanding heart to judge the people of Israel and the ability to tell good from evil. God not only granted Solomon’s request, but He also promised him riches and honor if he would walk in the steps of his father, David (1 Kings 3:4-15). Despite his good standing and his blessings, King Solomon disobeyed more than one command of God given to the children of Israel (Deut. 17:15-20). Thou shalt in any wise set him king over thee, whom the Lord thy God shall choose: one from among thy brethren shalt thou set king over thee: thou mayest not set a stranger over thee, which is not thy brother. 16 But he shall not multiply horses to himself, nor cause the people to return to Egypt, to the end that he should multiply horses: forasmuch as the Lord hath said unto you, Ye shall henceforth return no more that way. 17 Neither shall he multiply wives to himself, that his heart turn not away: neither shall he greatly multiply to himself silver and gold. 18 And it shall be, when he sitteth upon the throne of his kingdom, that he shall write him a copy of this law in a book out of that which is before the priests the Levites: 19 And it shall be with him, and he shall read therein all the days of his life: that he may learn to fear the Lord his God, to keep all the words of this law and these statutes, to do them: 20 That his heart be not lifted up above his brethren, and that he turn not aside from the commandment, to the right hand, or to the left: to the end that he may prolong his days in his kingdom, he, and his children, in the midst of Israel (Deut. 17:15-20). If Solomon had studied the Law like David his father (Psa. 1:2), would he have brought horses from Egypt? He not only brought them for himself but also for the kings of the Hittites and of Syria, whose favor he coveted. The Law of Moses forbade this action, and the prophets also warned the people of the consequences of disobedience. Deuteronomy 17:16—But he shall not multiply horses to himself, nor cause the people to return to Egypt, to the end that he should multiply horses: forasmuch as the Lord hath said unto you, Ye shall henceforth return no more that way. 1 Kings 10:28—And Solomon had horses brought out of Egypt, and linen yarn: the king’s merchants received the linen yarn at a price. 2 Chronicles 1:14-17—And Solomon gathered chariots and horsemen: and he had a thousand and four hundred chariots, and twelve thousand horsemen, which he placed in the chariot cities, and with the king at Jerusalem. 15 And the king made silver and gold at Jerusalem as plenteous as stones, and cedar trees made he as the sycomore trees that are in the vale for abundance. 16 And Solomon had horses brought out of Egypt, and linen yarn: the king’s merchants received the linen yarn at a price. 17 And they fetched up, and brought forth out of Egypt a chariot for six hundred shekels of silver, and an horse for an hundred and fifty: and so brought they out horses for all the kings of the Hittites, and for the kings of Syria, by their means. 2 Chronicles 9:27-28—And the king made silver in Jerusalem as stones, and cedar trees made he as the sycomore trees that are in the low plains in abundance. 28 And they brought unto Solomon horses out of Egypt, and out of all lands. Isaiah 31:1—Woe to them that go down to Egypt for help; and stay on horses, and trust in chariots, because they are many; and in horsemen, because they are very strong; but they look not unto the Holy One of Israel, neither seek the Lord! Ezekiel 17:15—But he rebelled against him in sending his ambassadors into Egypt, that they might give him horses and much people. Shall he prosper? shall he escape that doeth such things? or shall he break the covenant, and be delivered? Amos 4:10—I have sent among you the pestilence after the manner of Egypt: your young men have I slain with the sword, and have taken away your horses; and I have made the stink of your camps to come up unto your nostrils: yet have ye not returned unto me, saith the Lord. Why did Solomon take to himself 700 wives and 300 concubines? At the dedication of the temple God assured Solomon that his prayers had been heard and that the temple had been blessed. At the same time He warned Solomon that the divine favor and protection, which had been bestowed upon Israel, would continue only if their faith remained uncorrupted. If Solomon or anyone introduced idolatry, Israel would be punished and the temple would be destroyed (1 Kings 9:1-9). Not only did Solomon disobey the command not to multiply wives, but he also disobeyed the command not to introduce idolatry into the land. How could he rationalize his behavior? From a deeper study of Solomon’s life, we know that trade with other nations was another of his contributions to the nation of Israel, but it also contributed to his disobedience in marrying foreign women. 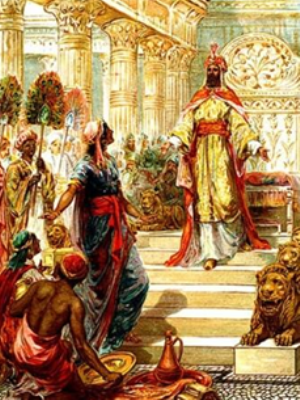 Solomon entered into trade agreements with a number of nations, increasing Israel’s wealth and prestige. Although Solomon had a strong army, he relied upon a system of treaties with his neighbors to keep the peace. Egypt was allied with Israel through the marriage of Solomon to the daughter of the Pharaoh. The sea-faring cities of Tyre and Sidon were also united to Israel by trade agreements. Some of Israel’s trade was conducted overland by way of camel caravans. But the most significant trade was by sea, across the Mediterranean Sea through an alliance with Tyre. Solomon’s ships apparently went as far west as Spain to bring back silver. Soon Solomon became the ruler of a huge commercial empire. Obviously Solomon became a victim of his own trade agreements. By custom, beautiful women were awarded to the most powerful member of a treaty to seal the covenant. [i] The constant influx of wives and concubines in Solomon’s court led eventually to his downfall (1 Kings 11:1-4), and we read that Solomon clave to these in love. Thus, Solomon broke the Law of Moses and violated the specific warning not to stray from the path of his father David. The scriptures are clear that Solomon understood the danger. We read in 2 Chronicles 8:11—And Solomon brought up the daughter of Pharaoh out of the city of David unto the house that he had built for her: for he said, My wife shall not dwell in the house of David king of Israel, because the places are holy, whereunto the ark of the Lord hath come. No doubt the large number of foreign women in Solomon’s court made many demands upon the king. Eventually he allowed these “outsiders” to practice their pagan religions. The result was that Jerusalem, and even its holy Temple, was the scene of pagan practices and idol worship (1 Kings 11:1-13). Solomon’s own faith was weakened. Later we read that he approved of, and even participated in, these idolatrous acts. The example he set for the rest of the nation must have been demoralizing. 1 Kings 11:1-5—But king Solomon loved many strange women, together with the daughter of Pharaoh, women of the Moabites, Ammonites, Edomites, Zidonians, and Hittites; 2 Of the nations concerning which the Lord said unto the children of Israel, Ye shall not go in to them, neither shall they come in unto you: for surely they will turn away your heart after their gods: Solomon clave unto these in love. 3 And he had seven hundred wives, princesses, and three hundred concubines: and his wives turned away his heart. 4 For it came to pass, when Solomon was old, that his wives turned away his heart after other gods: and his heart was not perfect with the Lord his God, as was the heart of David his father. 5 For Solomon went after Ashtoreth the goddess of the Zidonians, and after Milcom the abomination of the Ammonites. 1 Kings 10:14—Now the weight of gold that came to Solomon in one year was six hundred threescore and six talents of gold. 2 Chronicles 9:13-14—Now the weight of gold that came to Solomon in one year was six hundred and threescore and six talents of gold; Beside that which chapmen and merchants brought. And all the kings of Arabia and governors of the country brought gold and silver to Solomon. Eccl 5:10-12—He that loveth silver shall not be satisfied with silver; nor he that loveth abundance with increase: this is also vanity. When goods increase, they are increased that eat them: and what good is there to the owners thereof, saving the beholding of them with their eyes? The sleep of a labouring man is sweet, whether he eat little or much: but the abundance of the rich will not suffer him to sleep. This link (http://www.biblicalarchaeology.org/daily/people-cultures-in-the-bible/people-in-the-bible/50-people-in-the-bible-confirmed-archaeologically/) might prove interesting to some of you. There are many interpretations about Solomon. When I wrote my novel and became more familiar with his thinking from his proverbs and writings, I found it hard to believe that he was as bad as later writers made him out to be. However, he did manage to keep Israel from wars as peace reigned in his kingdom during his entire reign. Maybe archaeologists will find our more in time. Many of them question if Solomon ever really existed and was a legend because nothing has ever been found to substantiate his reign to date. Wisdom and the Song of Songs reveal a passionate caring individual. Just so you understand where I am coming from, read 2 Peter 1:20-21–Knowing this first, that *no prophecy of the scripture is of any private interpretation. * Why? Solomon, the wisest man who ever lived, speaks to us today through his books. A few quotations below tell why he chose to record the proverbs for us. They also tell many of his conclusions. I pray constantly that I am wise enough to understand. Proverbs 14:8—The wisdom of the prudent is to understand his way: but the folly of fools is deceit. Proverbs 15:21—Folly is joy to him that is destitute of wisdom: but a man of understanding walketh uprightly. Ecclesiastes 1:17—And I gave my heart to know wisdom, and to know madness and folly: I perceived that this also is vexation of spirit. Ecclesiastes 2:3—I sought in mine heart to give myself unto wine, yet acquainting mine heart with wisdom; and to lay hold on folly, till I might see what was that good for the sons of men, which they should do under the heaven all the days of their life. Ecclesiastes 2:12-13—And I turned myself to behold wisdom, and madness, and folly: for what can the man do that cometh after the king? even that which hath been already done. Then I saw that wisdom excelleth folly, as far as light excelleth darkness. Ecclesiastes 10:1—Dead flies cause the ointment of the apothecary to send forth a stinking savour: so doth a little folly him that is in reputation for wisdom and honour.